This pains me, because that answer flies in the face of years of tradition. But despite the calendar and my family’s full-throated observance of St. Patrick’s Day, I did not plant peas in the garden. The reason for this is simple: I’ve become suspicious that the cold shoulder the soil gives those seeds slows their germination. This delays the peas’ entrance into the world, dashing my hopes to get the season rolling. 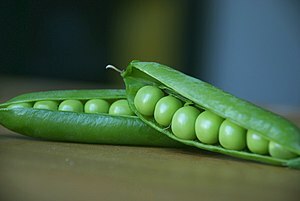 Though they’re a cool season crop, perfect for spring and fall gardens, peas are a bit of an anomaly. The plant likes it chilly, but the seed prefers it warm, with best germination at 50 to 75 degree soil temperatures. True, they’ll sprout if the soil is as cool as 40-degrees, but at those temperatures, peas take their time. My soil is registering a flat 50-degrees on the thermometer I shoved into the raised bed, which is why I vowed to wait an extra seven to ten days; to give the soil time to warm before sowing. What it boils down to is an experiment between my desire to plant and my resolve to wait. At this point, it’s a toss-up as to whether I can fight the urge; like a dieter determined to keep their mind off of food, I’m distracting myself with odd jobs, writing, and reruns of Glee. If you held onto tradition and planted peas, give them some water and patience. If they seem a bit slow to start, don’t give up on them. We’ll compare notes in a month or so, to see whose plants are further along. I have mine wrapped in a wet kitchen towel- they haven’t germinated yet. I guess I’m looking at a April 1st planting as well. I might try sprouting mine in a paper towel, too, Vidya. This year i am going with Wando, so have quite a few to play with.